CALGARY -- The National Energy Board says a building spree in non-hydroelectric renewable power projects between 2005 and 2015 took its share of overall capacity in Canada from two per cent to 11 per cent. Non-hydro renewable power such as wind, solar and biomass grew more than sixfold over that same time frame, rising from 2,360 megawatts to 15,600 MW. NEB chief economist Shelley Milutinovic says Canada is now the fourth-largest generator in the world of environmentally friendly power from sources including wind, solar, biomass and hydroelectric plants. Renewable power capacity increased by 26 per cent from about 75,000 MW in 2005 to nearly 95,000 MW last year, according to the federal regulator's report, Canada's Renewable Power Landscape. The report says hydroelectric power capacity grew by about nine per cent to more than 79,000 MW during the decade. Coal-fired power capacity declined by 39 per cent to 9,800 MW and natural gas capacity increased by about 75 per cent to 19,660 MW. "I think that's one thing people don't really understand (is) just how significant on a world scale Canada is on the renewable front," said Milutinovic. "It is fourth in the world on renewables after China, the U.S. and Brazil and it's second in the world in terms of hydro production. Only China is bigger." She says she expects renewable power to continue to grow thanks to support from governments and consumers. "Almost every province and territory has some sort of policy to encourage or promote renewables or support them," she said. "Things like Alberta moving off coal by 2030, 50 per cent renewables for power generation in Saskatchewan by 2030, all of those things offer strong support for renewables." Overall, renewable power capacity made up 66 per cent of Canada's overall power capacity last year, up from 62 per cent in 2005. The report says that 11 per cent of Canada's greenhouse gas emissions came from the electricity sector in 2014, the latest year for which statistics were available. That's down from about 16 per cent in 2005. From 2000 to 2014, emissions from the electricity sector fell 40 per cent, the report says, due mainly to the phase-out of coal in Ontario and initiatives to reduce emissions in Nova Scotia and New Brunswick. Ontario and Nova Scotia have seen the largest gains in renewable power generation from 2005 to 2015. 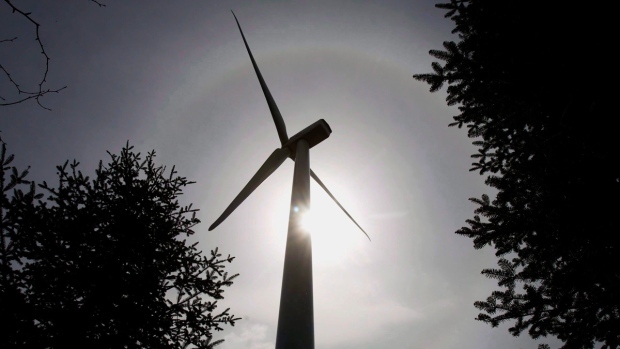 In Ontario, renewable power generation increased from 23 per cent to 34 per cent in that decade, while in Nova Scotia it doubled from 12 per cent to 24 per cent, the report says. Hydro is the dominant source of electricity in Canada accounting for 55 per cent of total installed capacity. Four provinces and one territory -- British Columbia, Manitoba, Quebec, Newfoundland and Labrador, and Yukon -- derive more than 85 per cent of their power from hydro. Two provinces and a territory relied primarily on coal or natural gas for electricity in 2015: Alberta (90 per cent), Saskatchewan (83 per cent) and Nunavut (100 per cent).